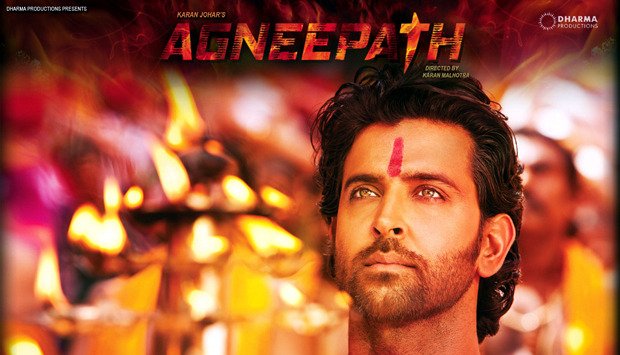 Julie M: So I saw Agneepath (The Path of Fire, 2012) this afternoon, as the third film of my Three-Hrithik Weekend (the other two films were Mission Kashmir and Guzaarish). Julie M: Better be prepared to take a virtual shower afterwards, as well. The scenes on theisland of Mandwa, which bookend the film and also one in the middle, are gray, burned-out, grimy and MUDDY. And everyone sweats, a lot. The story starts in 1977, in a village on the island of Mandwa, off the coast near Mumbai. Young Vijay (Arish Bhiwandiwala) is a hotheaded 12-year-old, tempered by the soothing hand and wisdom of his father (Chetan Pandit), the local schoolmaster. 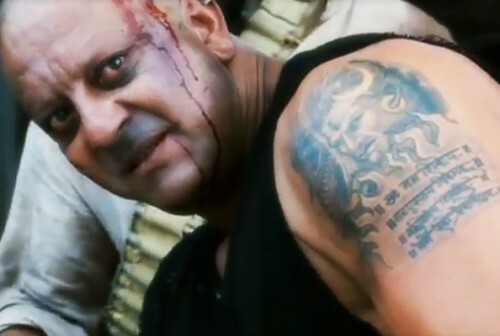 Meanwhile Kancha (Sanjay Dutt), the evil son of the ineffectual village headman, comes home–we get the feeling he has been released from prison–and decides to enslave the island for his personal financial gain, just because he can. Kancha cons the villagers into “leasing” him their land so he can build a salt factory, but what he really has in mind is to use their land to grow cocaine. Vijay’s dad tries to organize the villagers into instead supporting a salt collective to split the profits and it seems to be well accepted, but Kancha can’t stand this threat to his power and he organizes a situation to turn the villagers against the schoolmaster, resulting in everyone lynching him. At the same time, village rowdies who hate Vijay burn their home: Vijay and his pregnant mother (Zarina Wahab) barely escape with their lives. Jenny K: And that’s probably all in the first ten minutes! It’s interesting to me that the title of the original film with Amitabh Bachchan, comes from a poem by the star’s father, poet Harivansh Rai Bachchan. A real father-son project, in a way. Julie M: In Mumbai, Ma gives birth to Vijay’s sister and Vijay, mindful of his father’s lessons on how to gain and use power, does a favor for the local crime boss, Rauf Lala (Rishi Kapoor). Lala adopts him, Ma disowns him, and within 15 years Vijay has grown up to be a very clever and corrupt Hrithik Roshan, with a sort-of girlfriend (Priyanka Chopra), and is Lala’s right-hand man, and has had on his mind this whole time how to avenge his father’s death with Kancha. The plan is to draw Kancha close and then strike; but other situations intervene that Vijay must deal with. At this point things get very confusing, as all the sweaty gangsters look alike in the low light of the back alleys of Mumbai, and it’s hard to follow who is siccing whose gang on whom. How Vijay’s revenge takes place (because you know it does) is the climax of the story–and it is quite brutal, also not a little unrealistic. 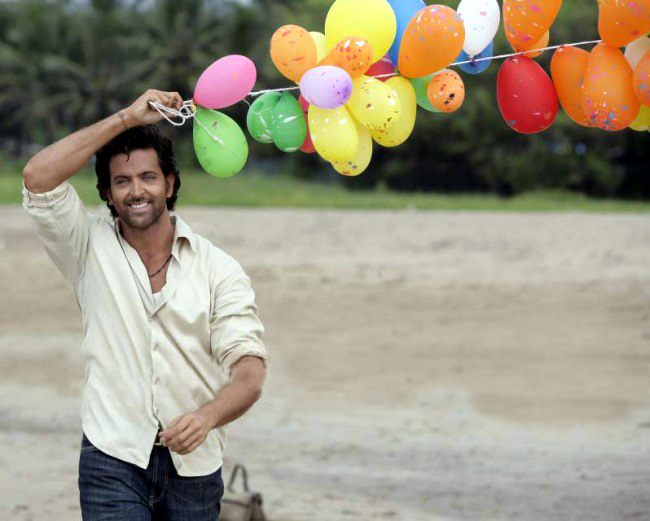 Hrithik uses pretty much one facial expression the entire movie, although in the 2nd half he does smile, briefly, in the one happy scene the film contains. Muscles are very much on display with plenty of flexing, which on Hrithik I always enjoy (cough—Fiza—cough). Not having seen the 1990 original (yet) I cannot compare his performance to Amitji’s, but I suspect it is more action-y. Hrithik does not dance except for maybe five steps during one dance number. Still, he’s good—better than good—to look at even though his acting was WAY better in Guzaarish. And I must say, whoever was the fight choreographer on this did an excellent job, most convincing I have ever seen in an Indian film to date. Jenny K: That’s what I was afraid of. I always hope that we’ll get at least one dance number from him. But the trailer left me in little hope of that. Criminal shame. Julie M: Speaking of dance numbers, they are gratuitous, spectacular, and totally out of place. Katrina Kaif’s item number, which takes place as Vijay has entered Kancha’s den for preliminary negotiations as Step 1 of his evil plan for revenge, is interesting although she makes three completely unnecessary (and unexplained) costume changes during the space of the 5-6 minute dance sequence (here’s the short version). Jenny K: Three changes of the lead dancer’s clothes is absolutely mild for an item girl, restrained, in fact. I sort of look at these things as mini-fashion shows. The Indian audiences expect them, and I’d love to know how much actually filters down into Indian fashion, modified, of course. Check out this masterpiece of overkill, a shipboard show from Humraaz. Amisha has at least four outfits and Akshaye almost as many. The questions I do have are, how does the dance troupe of, say ten, that you see auditioning for the job, early in that film, become the thirty you see in the show? Secondly, they may have the actual time for the fast changes, but to get Amisha up into the flies to enter from the ceiling, as well as change into that skintight outfit, may be pushing credulity a bit. Fun watching Akshaye, though. Julie M: Wait until you see the Katrina number in Agneepath. You’ll agree, given the setting, that the costume changes don’t make sense. Yours is a shipboard show, which sort of means it’s expected. But I still don’t understand how they got her hair to go from straight to crimped in four seconds!! Jenny K: I have seen the Katrina number on Youtube. Looks par for the course. Everyone uses “willing suspension of disbelief”, because no one expects realism. I particularly liked SRK’s dream bookending to the “Ishq Kamina” song in Shakti…that way everything’s explained by it being a dream. It’s unusual that they offer an explanation of any kind, but it’s nice once in a while. Julie M: In Agneepath Priyanka Chopra’s dance number is clearly there to show off her body and doesn’t advance the plot at all. She gets one good scene but she mostly just hangs around the rest of the time. But that “Chikni Chameli” song is going to have the impact of the Beedi song from Omkara. Super party song. Remake (as all the cool songs seem to be these days): here’s the original. And Sanjay Dutt was just too evil to be believed. Cartoon-evil, even. Although they tried hard to make him sympathetic—a pasted-on bit about mirrors—he just came off like a fat, slimy worm. And I think his over-the-topness weakened the film considerably. 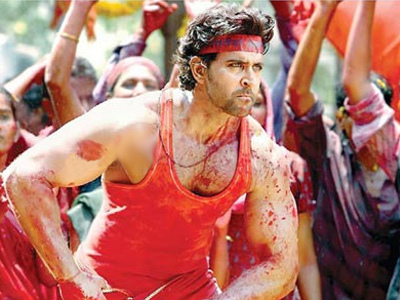 Overall–if you can stand the blood and are dying (ha ha) to see Hrithik, you could brave this film. On an objective level, yes, it’s more good than bad with high drama, melodrama and emotional content (if you like that sort of thing), but it definitely drags in the middle and I almost fell asleep. It’s clearly a love letter from Karan Johar to his father, who made the original 1990 version [Available on Youtube, here’s part 1] that didn’t do so well box-office wise, and should appeal to the young adult males who seem to be its target audience. It is also SO not a family film; despite the U/A rating, my theater had a dozen or so small children attending with their families, including one little girl sitting in the row ahead of me who looked to be about three or four, and she was crying in terror at the ending. I think a lot of those children will need counseling and chicken soup tonight. I almost wish I hadn’t gone, because it wasn’t that great a movie to have waded through all of that. I found the second half not as interesting as the first half, although Hrithik’s acting range was better in the 2nd half. Solid two stars, and would gain another if Hrithik moved his face more and the rivers of blood were diminished by half. 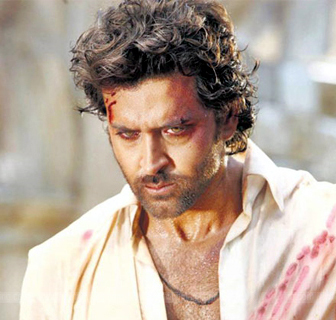 Agneepath was a furious onslaught of fists and pheromones. Don’t be so hard on HR…there are definitely three distinct facial expressions here: dreamy/anguished, dreamy/angry-intense, and just plain dreamy. I can’t explain my reaction; he’s not even my Bollywood “type” per se, but…Hrithik is just your non-garden variety gorgeous, and in Agneepath, I couldn’t take my eyes off him. It’s hard to complain much about niggling little picky things like the repetitive quality of the mayhem and the sheer lack of thought-provoking plot when he’s such eye-candy. I have no idea if his acting is still progressing. It hardly needs to. I am blinded to any faults by his glorious person. Even his estranged little sis in the film was so smitten with this Godlike Bro that she wasn’t even appalled when he expressed his love for her by killing a man, or was it men, with his bare fists. In front of her. Strange? Maybe not. I’d probably forgive him, too, if he looked into my eyes with that special patented soulful gaze in his baby browns. Accuracy to the wayside; “hazels” just doesn’t have the same ring. Julie M: Eye-candy? More like eye-big-juicy-steak…completely wasted on Priyanka’s character–but then again, monomaniacal revenge-focused heroes like that don’t need heroines (not that she was a heroine by any means, just a distraction that he was man enough to marry for her happiness rather than his). Jenny K: I thought it was so odd that he gave in and married her at the end, when I’d been assuming all along that he wasn’t marrying her because he loved her and knew his days were numbered, and he’d be putting her in danger. And he was right! But that’s being way too logical for this scenic mish-mash. I’ll give Agneepath a score of “four sighs.” That is to say that for the normal heterosexual female, the masculine landscape of this film’s heroes (and I include Chetan Pandit, who seems like a throwback to a 1960’s Khanna/Kapoor style, delightful eyeful) will make the meat-tenderizing sections of this film that your date likes, bearable. Sanjay Dutt’s new look won’t. Though the one thing I took away from SD’s performance was the thought that if they don’t rework the Mickey Rourke comeback vehicle, The Wrestler, for him they are missing a golden opportunity. Julie M: I found a “behind the scenes” feature—in two parts, here and here that I recommend only if you’ve already seen the film, as they contain spoilers.